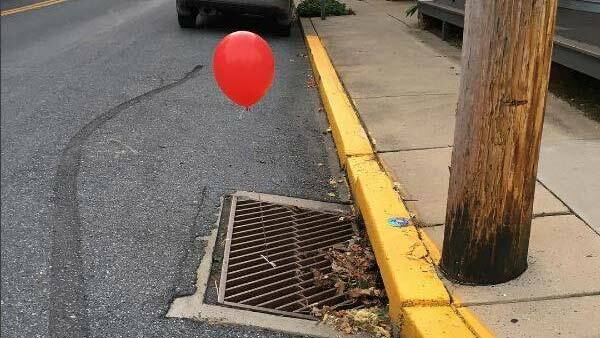 LITITZ, Pennsylvania -- A girl says she and her friends are behind the red balloons found tied to sewer grates in a small Pennsylvania town, not a homicidal clown. Seventeen-year-old Peyton Reiff tells PennLive.com the girls were trying to scare their friends in Lititz after seeing a trailer for the upcoming movie "It." A red balloon is the calling card of Pennywise, the sewer-dwelling, child-eating clown in Stephen King's novel-turned-movie. Reiff says the teens were surprised at how much attention the prank got after the local police made a playful post on Facebook, saying they were "completely terrified" to remove the balloons. Reiff says they will meet with the department for a "funny follow up," but says they are not being punished.